An authentic example: Note the chain lines in the paper. at its base and to the right. (This is not the example selling at Heritage). A genuine bookplate belonging to George Washington will fall under the hammer at Heritage Auctions, February 11-12, 2010, at their new Beverly Hills, CA branch, sale 6038, lot 37023. Authentic examples don’t come to market very often, although genuine fakes are easily acquired; the Mount Vernon online store offers them for five-and-a- half georges. Heritage’s starting bid is $1,500. The bookplate is, as to be expected, toned, otherwise in very good to near fine condition. It is estimated to sell for $3,000-up. George Washington's bookplate was copper-engraved to his order and specifications in London in 1792. 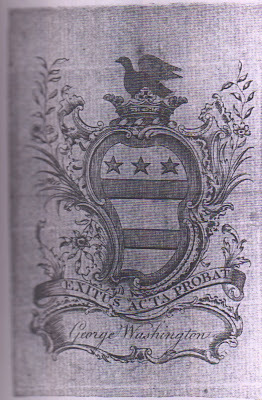 Showing the family coat-of-arms, Washington proudly affixed it to many of 1000+ volumes in his library. There are two extremely important points to be aware of when judging whether you have a true Washington bookplate or something meant to deceive if not labeled as a later restrike (in the late 19th century the plates were reprinted from the original engravings but on current paper), or sold as an inexpensive facsimile. Suffice it to say, if you, on close inspection, see a dot matrix, you have an inexpensive reproduction. First, the paper has to have chain lines, indicating that is of the eighteenth century. This can be observed simply by backlighting it. Two - and most important - the engraver’s burin slipped and he made a mistake, a small line you have to look for very closely. Our friend, Lew Jaffe aka The Man With a Bookplate Jones, has two excellent examples on his web-blog, Confessions of a Bookplate Junkie. The image above is from his site.